My take on this collection, I think it’s a bit all over the place personally. However, I can see people wearing a few of these items as individual pieces. This show opens with the audience placed sectioned off around hospital gurney. The music is eerie and a phone rings as the music plays. 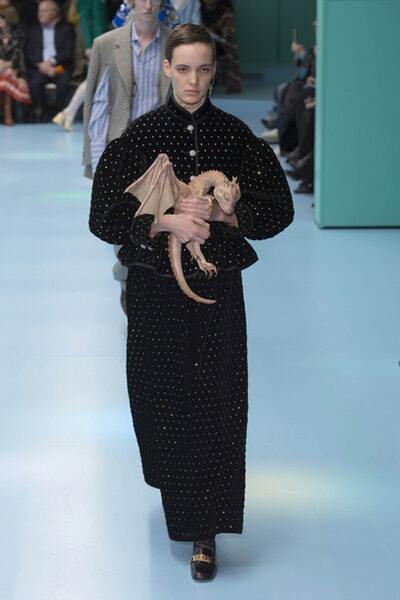 Models walk out holding unique accessories from snakes, wax figured heads, shrunken dragon, and horns that extended from the model’s heads. Many people are speculating that this inspiration has already been done by Rick Owens. Some of the looks included oversized sweaters and coats, ski mask, and accessorized headdresses. As I have stated in the previous post some designers like to put all of their garments together. This theory seems to be a trend. The models also appeared to look otherworldly. I interpreted the overall theme as a clash of culture which meets past, present, and future. Gucci posted on their Instagram page the following statement below. The concept reflects the work of a designer-the act of cutting, splicing and reconstructing materials and fabrics to create a new personality and identity with them. The materials used are typical of an operating room and the environment around it: PVC on the walls and floors, fire doors with panic-bars, LED lamps, and plastic chairs like those in a waiting room.